Fibre Glast makes a unique reinforcement offering with the Carbon/KEVLAR® Hybrid. This First Quality hybrid fabric combines all the advantages of carbon fiber and KEVLAR® to deliver a product that boasts a high strength-to-weight ratio and dimensional stability, in addition to a remarkable impact-, abrasion-, and fatigue resistance. The colorful, eye-catching twill weave makes this hybrid an ideal choice for a surface layer, used alone or backed with another layer of reinforcement to create a maximum balance of properties. 3K carbon makes up the warp and 1500 Denier KEVLAR® fibers are woven to make up the fill. Click on the selected styles below for more detailed information and pricing. All three of our Carbon/KEVLAR® hybrids are identical in performance, and only vary by color. 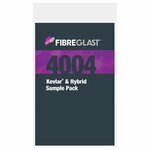 While many variations of KEVLAR® exist, Fibre Glast offerings incorporate KEVLAR® 49, specifically designed to produce hard laminate parts for composites. None of our hybrids should be considered for flexible, or soft, applications. 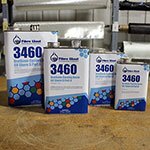 Each can be used with epoxy, vinyl ester, or polyester resin. You can place an order here on the website, or call 1.800.838.8984, 8 a.m. - 7 p.m.EST, Monday through Friday, with questions. 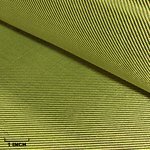 KEVLAR® fabric is made with genuine DuPont™ KEVAR® fiber. DuPont™ and KEVLAR® are registered trademarks of E.I. du Pont de Nemours and Company and are used with permission.